I'm not sure if this is a new Trader Joe's product, or if I have just somehow never seen them before. 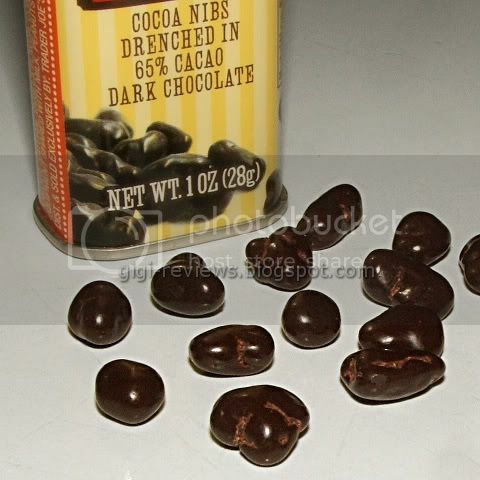 But on a recent trip to Trader Joe's, they had these cute little tins of dark chocolate covered cocoa nibs at the register. And how could I resist something like that? 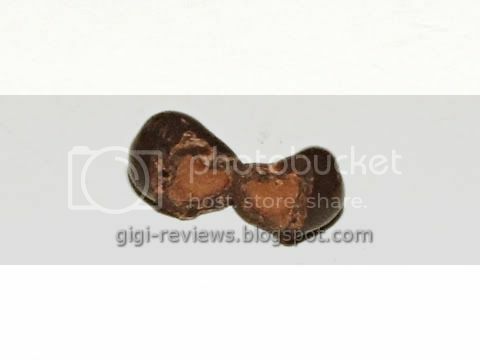 If you don't know, Cocoa Nibs are little bits of cocoa beans that, rather then being processed to become chocolate as we know it, are instead hulled, fermented, roasted, etc. Eventually, after a whole lot of work, what you get is a little tiny nugget of chocolaty goodness. Cocoa nibs were a trendy ingredient a couple of years ago -- but even though they are not quite as popular as they were at the height of the craze, they never really went away. And I love them added to candy. What I have never had is the nibs themselves as the candy. 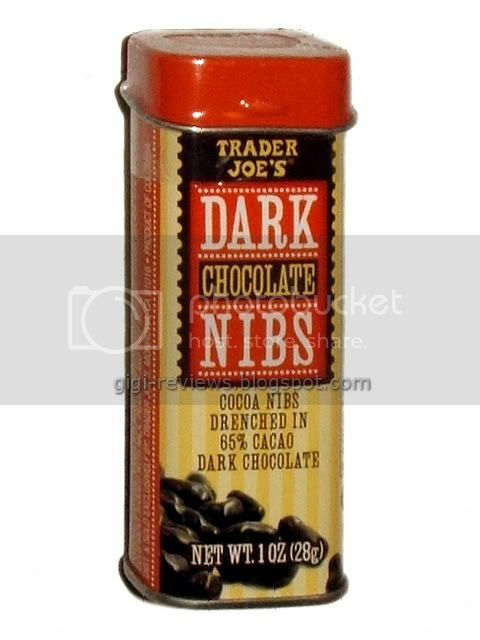 In Trader Joe's version, each little nib is coated in 65% dark chocolate...and comes in at a mere 1 calorie a nib! Each little nib is shaped roughly like a booger. But it's like a booger with a high gloss chocolate coating -- you know, a civilized booger. A genteel booger. The traditional chocolate flavor that you are expecting comes completely from the coating. The amount of dark chocolate is quite generous. The melt is smooth and surprisingly creamy. With the first few, it takes some adjusting to get used to the strong flavors. (Unless you already eat a lot of high-cacao chocolate.) But once you do, these nibs are addicting. Besides the flavor, the crunchy texture is great. It sort of implodes on itself when you bite it, if that makes any sense. It's a good thing the tin is small and the calorie count low, because I could grub on these all day. Admit it, you want these. So go to Trader Joe's and get some. I didn't see them at my TJ's! They were on the registers right next to the fruit leathers if that helps you. I have seen them so far in both Upland and Claremont TJ's in the same spot.